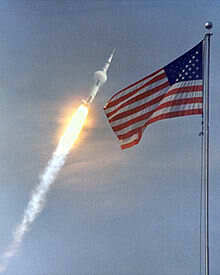 Apollo 11 was the spaceflight that landed the first humans on Earth’s Moon on July 20, 1969. The mission, carried out by the United States, is considered a major accomplishment in the history of exploration. 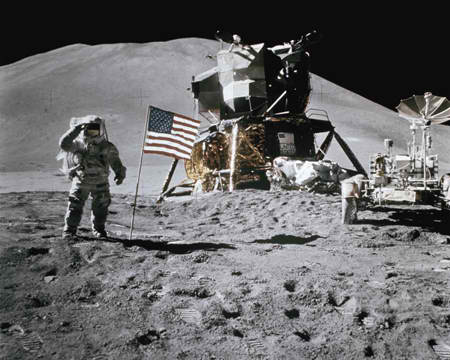 Launched from Florida on July 16, the third lunar mission of NASA’s Apollo program, was crewed by Commander Neil Armstrong, Command Module Pilot Michael Collins, and Lunar Module Pilot Edwin “Buzz” Aldrin, Jr. On July 20, Armstrong and Aldrin landed in the Sea of Tranquility on July 21 became the first humans to walk on the Moon. Their landing craft, Eagle, spent 21 hours and 31 minutes on the lunar surface while Collins orbited above in the command ship, Columbia. The three astronauts returned to Earth with 47.5 pounds (21.5 kg) of lunar rocks and landed in the Pacific Ocean on July 24. Apollo 11 fulfilled U.S. President John F. Kennedy’s goal of reaching the Moon before the Soviet Union by the end of the 1960s, which he had expressed during a 1961 mission statement before the United States Congress: “I believe that this nation should commit itself to achieving the goal, before this decade is out, of landing a man on the Moon and returning him safely to the Earth.” Five additional Apollo missions landed on the Moon from 1969 to 1972.